Tuna and smoked piquillo peppers in one snack? For me this beats putting your chocolate in my peanut butter any day. 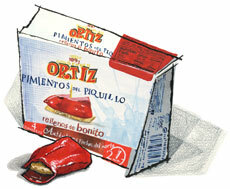 The Ortiz family's great bonito tuna, stuffed in smoked piquillo peppers, doused in a bit of tomato sauce. A classic Catalan tapa, as delicious as you’re imagining right now, ready to eat right out of the tin. Four stuffed peppers per tin.